290 pages | 2 B/W Illus. The Selected Works of Professor Ray Bull include some of the most influential insights into the psychology of investigative interviewing. Whether it has been determining whether a suspect is lying or telling the truth, enabling children to provide reliable testimony, or understanding how the dynamics of the interview process itself can affect what is achieved, Professor Bull has been at the forefront in researching this fascinating area of applied psychology for over 40 years, his work informing practice internationally. An elected Honorary Fellow of the British Psychological Society and the first Honorary Life Member of the International Investigative Interviewing Research Group, Professor Bull also drafted parts of the government’s Memorandum of Good Practice and of Achieving Best Evidence on Video Recorded Interviews with Child Witnesses for Criminal Proceedings. Including a specially written introduction in which Professor Bull reflects on a wide-ranging career and contextualises how the field has evolved, this collection will be a valuable resource for students and researchers of forensic psychology. Bull, R. (2013). What is ‘believed’ or actually ‘known’ about characteristics that may contribute to being a good/effective interviewer? Walsh, D., and Bull, R. (2012). Examining rapport in investigative interviews with suspects: Does its building and maintenance work? Soukara, S., Bull, R., Vrij, A., Turner, M., & Cherryman, C. (2009). A study of what really happens in police interviews with suspects. Paulo, R., Albuquerque, P. B., & Bull, R. (2016). The Enhanced Cognitive Interview: Expressions of uncertainty, motivation and its relation with report accuracy. Milne, R., & Bull, R. (2003). Does the cognitive interview help children to resist the effects of suggestive questioning? Memon, A., Wark, L., Bull, R., & Köhnken, G. (1997). Isolating the effects of the cognitive interview techniques. Dando, C., Bull, R., Ormerod, T., & Sandham, A. (2015). Helping to sort the liars from the truth-tellers: The gradual revelation of information during investigative interviews. Dando, C., & Bull, R. (2011). Maximising opportunities to detect verbal deception: Training police officers to interview tactically. Mann, S., Vrij, A., & Bull, R. (2004). Detecting true lies: Police officers’ ability to detect suspects’ lies. 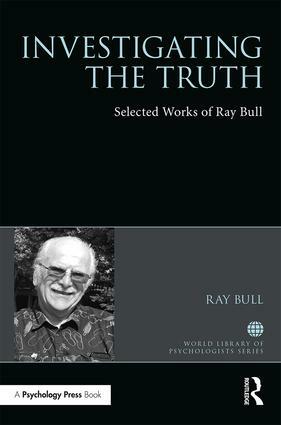 Ray Bull is Professor of Criminal Investigation at The University of Derby, UK. He has previously held the position of President of the European Association of Psychology and Law. In 2008 he received from the European Association of Psychology and Law the Award for Life-time Contribution to Psychology and Law. He regularly acts as an expert witness and conducts workshops/training on investigative interviewing.